This is consistently one of the best maduros available. It has a wonderful flavor and keeps it right down to the fingertips. A most enjoyable smoke. CAO has so many different cigars and have never had a bad one....great brand. Great cigar, well made with beautiful dark wrapper, the appearance makes you want to pick this cigar everytime among others in your humidor. It appears as though it will be a very strong smoke, buts its suprising mellow without being weak. I recommend! Great cigar with good construction and flavor. Never disappointed with these sticks. Love these cigars in all sizes, Gols and Corcovado's are my go to quality 1 hour smoke. Very smooth from start to finish. Always fresh. Good looking cigar for those who like a full body stick. 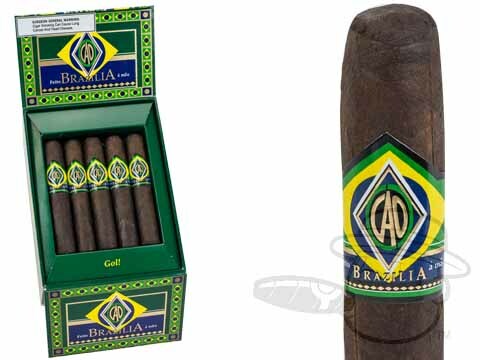 CAO Brazilia Gol is rated 3.9 out of 5 based on 12 customer ratings.